Usual run. 14 total. Kids ran their usual distances with the exception of Julia (2 miles), and Matthew (did not run) due to colds. With Joseph and Jacob. I think we had Jenny for part of it. Usual run. Kids ran their usual distances. Matthew was back to normal today - in fact he ran one of his fastest times for 200 meters - 1:09, only 1 second off his record. However, Mary got a bad cough. With Joseph, Jacob, and Jenny. Total of 14. It was slippery in a lot of places. Kids ran their usual distances except for William who did 3. Joseph and Jacob did a pickup for the last mile on the little boy course. Their target was 7:00, they ran 6:50. Benjamin slept in this morning and was feeling tired in general, so I ran with him 8 miles in the afternoon. Otherwise kids ran their usual distances. 18 total. Usual Saturday distances for the kids except for Jenny who took the ACT today and ran only 3. Benjamin and I did 6x1000 with 200 recovery in the canyon - first 2 down, next 2 up, and last 2 down. There was some slippage on the roads. I hit my downhill ones in around 3:30 - 3:34, uphills were 3:49, 3:53. Benjamin did the downhill ones in around 3:06, last one 3:01, uphills were 3:25 and 3:35. A tempo run of sorts. Out to meet Benjamin, Joseph, and Jacob, a little further to make it an even distance, then back to catch up, and finished with them. Total of 11. We tapered for the 10 K. Benjamin did 8, Jenny, Joseph, and Jacob 2. Julia was still sick and ran only 1 mile. Otherwise usual distances. Benjamin and I did a 2 mile tempo down the canyon in 11:24. The road was mostly clear, but we both for some reason had a hard time staying awake. With Joseph, Jenny, and Jacob. Total of 8. Tapering for the 10 K. Kids were on reduced mileage - Benjamin did 6, Joseph, Jacob, and Jenny 2. Julia felt good enough to run 2 miles today. Benjamin and I did a pickup for 0.75 down the canyon in 3:54, splits 76,78,80. It gave a cause for concern - I kept losing steam, and Benjamin said he was feeling the pace was hard. He did stay up a bit later than normal the night before doing his home work, though, so that might be the reason. Salt Lake Track Club 10 K, 36:25, 4th overall, first master. Benjamin ran 32:48, 3rd overall, new course/unaided 10 K PR. The conditions were good. Well, not perfect, but much better than two weeks ago. Temperatures a little above freezing, mild wind, cloudy skies. Got some inversion, not sure how much of a factor it was. All in all today was the day of the Crocs' revenge. We ran as a family. Joseph and Jacob had a close race with Jacob pulling away at the end. Jacob ran 41:14, Joseph 41:16. Jacob managed a negative split - 20:40/20:34. Joseph's I think was either even or slightly positive. Benjamin had a negative split 16:26/16:22. Mine was positive, but respectable - 18:05/18:20. Jenny ran 45:14, 5th woman overall. She made the mistake of starting too far in the back - her actual time was around 45:04. Sarah found out she was pregnant a few days and took it easy today running 58:56, but she also started too far in the back. Julia was feeling better after the sickness last week, but still not 100% so she took it easy as well running the first 5 miles with Sarah, and then picking it up in the last mile. She ended up with 56:48. 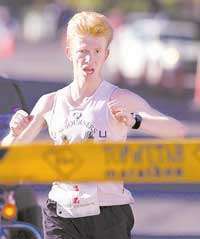 Garek won in 31:24, Riley was second in 31:34. Benjamin ran with the for the first 2 miles at 5:10-5:15 pace, then they sped up to something around 5:05 and he did not have that gear. However, he held on alone quite well. So based on that, runners in traditional shoes more or less doubled their snowy 5 K time in the dry 10 K, while the Croc runners were 1 minute per 5 K faster given the double distance on a dry road. That should answer Jesse Hornok's question from the previous race post. My splits per kilometer: 3:26, 3:39, 3:41, 3:41, 3:40, 3:48, 3:39, 3:39, 3:39, 3:35. First 2.5 K was 8:54, last 9:00, so I was happy that I ran 17:54 5 K over the same course in the middle of a 10 K.
The race, includes running back to help the kids and Sarah. Back to meet Joseph and Jacob, then finished with them. Back to meet Sarah, then finished with her. 14 total. Usual distances for the kids. 6x1 K workout with Benjamin. 2 down, 2 up, 2 down. He did the first 4 with me, then ran his pace for the last 2 - 3:00 and 2:58. I went too fast with him in the first 4, and it showed in the last two - had no juice. Part of the problem may have been the lack of sleep as well. Kids otherwise ran their usual distances. 10 total. Kids ran their usual distances. Did a workout with Benjamin. 2x2 miles with 2 mile recovery down the canyon. Got 11:22 and 11:15. Benjamin did 10:20 and 10:07. Joseph and Jacob did 5, Jenny 6, William 3, otherwise usual distances for the kids. 13 total. Had Joseph and Jacob run only 3 as they were feeling tired. Total of 14. Did 2 mile tempo down the canyon with Benjamin. He paced me through the first mile in 5:26, then ran the last in 5:00. I was able to close in 5:31 alone. Happy to be under 11:00 - I think this was the first time this year. Joseph and Jacob looked like they had some energy so I gave them a challenge to average sub-7:00 over their 4 mile course. They were able to do it - 27:14 for Joseph, 27:23 for Jacob. Total of 13. Slept in this morning, by the time I got up Benjamin had already run one mile. Usual distances for the kids. Total of 12. Tapering for the 15 K - somewhat. Benjamin and I did a 2 mile tempo down the canyon. He paced me through the first mile in 5:24, then sped up to 4:53. I closed in 5:30 and got 10:54 - 3 seconds faster than on Tuesday. The inversion bothered me a bit while jogging, and a lot in the workout. I think it bothered Benjamin somewhat as well - he got a side ache when he sped up, but was able to run through it. My solution to the inversion problem is convert most of the office work to be remote. It is really a better way to do things - I have been doing it for the last 16 years. It is like exercise and eating healthy - you get better results when you do it, but it requires some organization and overcoming inertia, and it is something you will think you cannot do if you follow the short-circuit thought patterns. Thousands of people drive to the office every day for the sole reason that either they do not know how to use remote communication tools effectively, or their employer does not, and not willing to learn the new patterns. I am a registered Republican, and I tend to vote Republican although in 2008 I could not bring myself to vote for McCain, and of course I would not vote for Obama, so I voted for Chuck Baldwin. And in 2016 if Trump gets the nomination, I will be voting for a non-major-party candidate again. I favor reduced taxes and deregulation in general. But I would support a bill with both hands that would impose an environmental pollution tax on businesses that made their employees drive to work when they were willing to do their work from home and a reasonable case could be made that they could be at least equally productive. Or maybe calculate the business tax based on the number of office employees that drive to work, and let the free market figure out how to reduce that number productively. 10 total. Kids ran their usual distances expect for Benjamin who did only 6 - tapering for the 15 K tomorrow. We did a 0.75 interval down the canyon in 3:48 with the splits of 76,75,77. Much better than two weeks ago (76,78,80). Hopefully this will translate into a better race tomorrow. SLC Track Club 15 K, 56:54 (officially 56:57, but I am pretty sure that was off), 9th overall, 1st master. Not a good race for either myself or Benjamin. The conditions were near perfect, but neither one of us could taken advantage of them. Something was terribly wrong today for both of us. I felt a little weak at the start, but did not think it would result in this kind of a disaster. I opened with 3:28 1 K, felt decent, 5:40 at the mile, 7:06 at 2 K. So far so good, then boom, cannot even break 6:00 in the mile. Made it to the 5 K in 18:24, rallied a bit with 6 K in 22:06, and then boom. I longed for those 6:02 miles, because even that was not happening. 27:58 at the turnaround, 37:34 at the 10 K (19:10 5 K), and then the last 5 K in 19:20. Benjamin ran 53:20. He went out in 5:14 for the mile, then 5:23, and then he could barely run 5:50 the rest of the way. I am suspecting the chronic lack of sleep finally caught up to us. He has been busy with school. I have been busy with work and trying to teach the kids at the same time. So we got sloppy about going to bed on time. This race is a wake up call. Time to get strict about bed time. Kids ran their usual distances at home today. Finally got good sleep. A nap on Saturday, 10 hours Sat-Sun night with only one Mary-wants-to-watch-a-Russian-cartoon midnight interruption, then then 1.5 hour nap on Sunday, and 8 hours Sun-Mon. I was amazed. My body happily took all of that sleep. It was almost like in the Soviet prisoner song "Comrade Stalin" : "We are falling down on the prison bunks like the trees we have been chopping and we have no knowledge of the insomnia of our leaders." Total of 14. Usual distances for the kids. Did a pickup with Benjamin for 1 mile down the canyon in 5:14. Felt very good. I am still in shock over how I have been able to trick myself into this long term sleep deprivation. I am thankful for the fiasco at the race on Saturday to give me a wake up call to take care of the matter.